Bubba Watson has never had a golf lesson. If you follow the PGA Tour, you probably knew already that the winner of the 2012 Masters Tournament was self-taught because it's so unusual in a player of his stature. Golf is a technically complex sport. Few players are able to break 80 without years of lessons, let alone win a major championship. Running is different. It may be the simplest sport of all. The elite ranks are full of runners who coach themselves. The average recreational runner is fully capable of coaching him or herself as well. Designing an effective training plan is a process that consists of only five basic steps. Once you've learned them, you can design your own fully customized workout schedules with confidence. The rest is just hard work. Training plans exist for one reason: to prepare runners for a "peak" performance in a designated race. 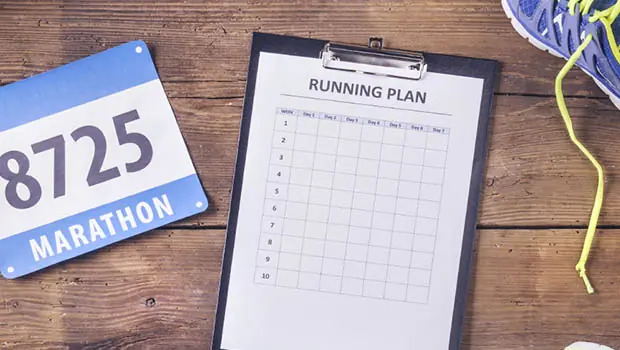 So the first step in the process of creating a training plan is to choose the race that will mark the end date of the plan. When you choose a race, be sure to do so in consideration of how long you will need to get ready for it. The standard range of training plan durations is 8 to 24 weeks. If the race you're aiming for is short (e.g. 5K) and your initial fitness level is fairly high, eights weeks is plenty of time. If you're targeting a marathon and you're currently not in the greatest shape, allow 20 to 24 weeks. Obviously, when you're getting in shape for a race, your workouts need to change from week to week. But your basic weekly workout schedule should remain the same. You should do the same number of runs each week, and your hardest runs should fall on the same days. Imposing a fixed weekly workout template on your training will keep the process organized and make the results more predictable. Following is the template I use with most runners. Harder workouts are indicated by shading. Feel free to create a different template if this one doesn't fit your schedule. But if you do, be sure to surround harder runs—a category that includes both fast runs and long runs—with easy runs that are neither fast nor long.